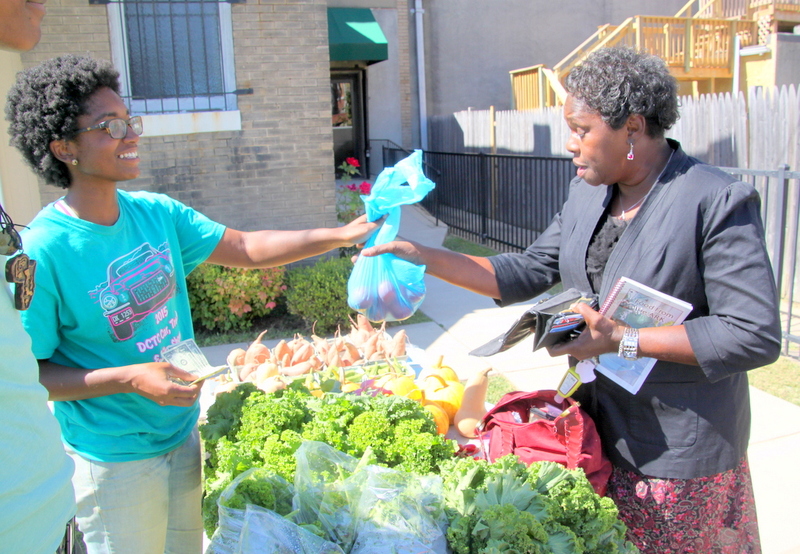 Above: Barbara Williams buys tomatoes from Aleya Fraser outside the Ark Church in East Baltimore. The women came out of a midday Wednesday service at Ark Church on North Avenue to a bright and colorful sight – red tomatoes the size of tennis balls, deep-green okra pods, pristine white turnips and yellow-and-orange-streaked winter squash that resembled miniature pumpkins. 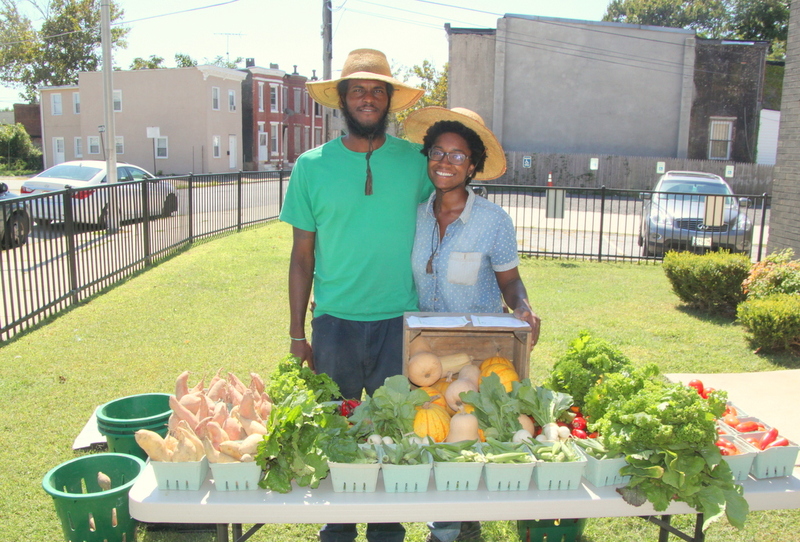 “Well, what do you have today?” Barbara Williams asked the farmers from Black Dirt Farm, who had driven nearly two hours from their Eastern Shore farm to sell produce on a table outside this small East Baltimore church. “Oh I don’t like those sweet turnips, I like the bitter ones! I’m sweet enough already!” the 69-year-old Williams said, cracking everyone up and proceeding to buy some tomatoes. Ordinarily, to get produce like this, the 79-year-old would have had to make a special trip to the Northeast Market many blocks away. Giving people in the city access to fresh healthy produce is what this weekly farm stand event is all about, said Aleya Fraser, a co-founder of Black Dirt Farm, located on 137 acres in Dorchester County. For the past three months, Fraser, farming partner Blain Snipstal and other members of the Black Dirt Farm Collective have been coming up to this spot to sell their produce after weekday church-services let out. They are part of a broader effort spearheaded by Rev. 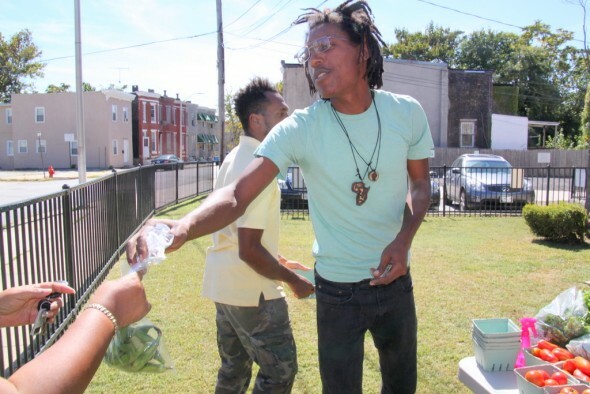 Dr. Heber Brown III, of Pleasant Hope Baptist church in Baltimore – the Black Church Food Security Network. The Baltimore Food and Faith Project of the Johns Hopkins Center For a Livable Future is also a collaborator in the evolving Network project. 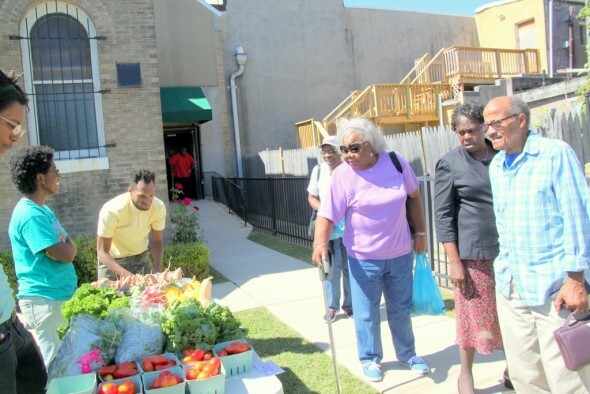 “We’re trying to figure out ways that the black churches in Baltimore can help give people access to good food in places that are food deserts,” Fraser said. Other parts of the network include an urban gardening project at the 1800 block of Aisquith Street that meets on Saturday, as well as Pleasant Hope’s own church garden on East Belvedere Avenue. Helping people eat tasty and healthy meals is the major idea behind the project, Fraser said. They had recipe cards on the table for any who wanted them – for Okra Corn Fritters, Maple Roasted Sweet Potatoes and other savory dishes. Linda Yates said that although she’s been a lifelong member of the church and moved out of the neighborhood to Cedonia, she still comes back for services and, now, the vegetable sale. “It’s healthy food. I love it. I cook it for my four grandchildren. 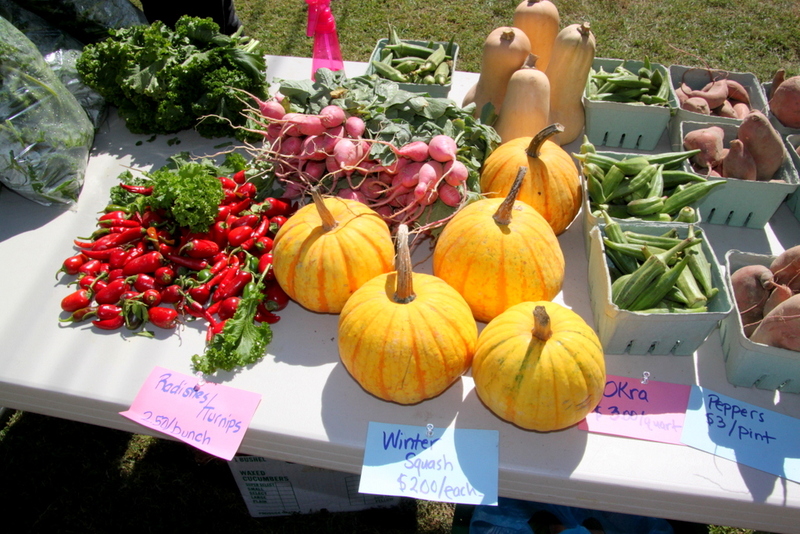 They love it,” said Yates, 65, showing off her bag of mustard greens, tomatoes, turnips and squash. She had plans to cook up the turnips with ham hocks, an old family recipe that made her think about her roots. Co-op members said they’ve been enriched by the farming experience as well. Philip Taylor, a 28-year-old landscape designer who has only lived in the city and the suburbs, said his involvement with Black Dirt has been surprisingly gratifying. He said watching Blain and Aleya juggle day jobs and their Black Dirt work was not just fun, but inspiring.